Enchanted Cottage is a beautiful cabin for rent in the gorgeous North Georgia Mountains. Property Size 2,505 sq. ft.
Peacefully located at the quiet, private end of a well maintained .8 mile gravel road, this enchanting newly and professionally decorated log cabin will rejuvenate and inspire! Three full finished levels provide abundant room for two families, lots of friends, or spacious romance. 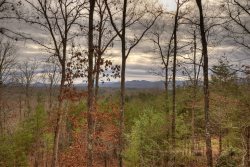 Enjoy the clean mountain air from the private, screened porch off the master bedroom. Soak in the Jacuzzi or enjoy al fresco dining from the screened wraparound porch. Enjoy rest time with Blu-rays, DVDs, all in high def surround sound. Invite everyone to a billiards or video arcade tournament in the game room. Nighttimes are a blast with the outdoor fire pit, ideal for roasting marshmallows. High speed wifi and on-site cell phone signal booster provide convenient access to the rest of the world when needed. Games/Entertainment: Pool Table, Silver-Ball Table Top Video Game with 38 Arcade Games Including Several Pac-Man Variations, Galaga, and Donkey Kong. Lots of Toys, Board Games, Dolls etc. Available for Kids.